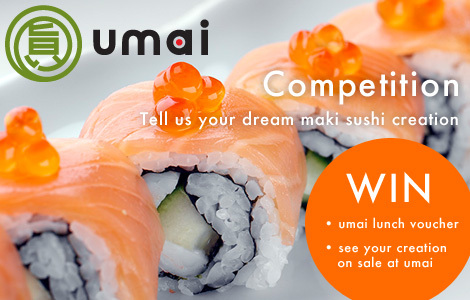 Competition: Create Your Own umai Sushi! As much as we love to create new and exciting sushi at umai by Japan Centre, we love to hear suggestions from our favourite customers to see what sort of sushi they want to eat! This is a great competition for you to get involved in expanding the range of fresh and delicious sushi at umai… and win some great gifts at the same time. To enter the competition, head over to our umai facebook page and become a fan if you aren’t already. Then simply leave a comment on the competition post telling us your dream fillings for a brand new sushi roll variety. You can include anything you want from traditional fillings such as tuna and salmon, to something a little less conventional like cheese, beef or even something sweet like strawberry jam. This is a great lunch for a hungry individual or enough for two people to try the fresh sushi that we have at umai! As long as we have the means to do so, the winner will also get to see their brand new sushi creation made by our expert chefs and put on sale at umai for the whole world to taste! Please note that although we hope to be able to make any suggested sushi creation, there may be limitations with certain ingredients. The competition closes next Friday, 9th September, so be sure to leave your submission by then. We will contact the winner over the weekend with a private message through facebook. So what are you waiting for, head over to the umai facebook page and leave a comment to tell us your dream fillings for a new variety of sushi. Why not check out Japan Centre if you need some inspiration for some Japanese ingredients! Posted in Uncategorized and tagged competition, sushi. Bookmark the permalink.